Angela comes from a family of young mothers; her mother, grandmother, and great-grandmother all had children when they were just girls themselves. Angela is determined to break the cycle and finish her education. Both Angela’s mother and grandmother are epileptic. This, coupled with lack of education, makes them totally unemployable, even as day laborers. They all rely on her great-grandmother to sustain them, who has one cow that they all feed from. Her great-grandmother raised some money for school from contributions from her church, and was able to send Angela to secondary school. This contribution, however, could only cover two terms meaning Angela would not be able to go back to school for the third term. Angela is a very smart girl, and determined to escape poverty and take her family with her. 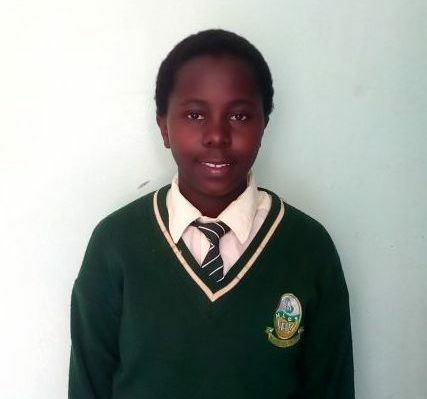 So, she approached the school administration to allow her back in school, proposing that her great-grandmother pay for her fees using farm supplies, including the milk her family depends on for sustenance. Her determination touched the school principal, who allowed her to stay in school until she finds help. However, she can’t rely on this charity forever. Angela needs help with school fees, school supplies, and personal utilities. She is a very driven young woman, set on being a successful person in the future. Help Angela achieve her dreams by sponsoring her today!